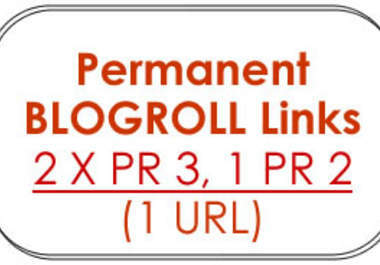 Very rarely can you get 5 permanent blogrolls.You will get 1 permanent blogroll backlink inserted into 2 of my PR3 websites, 3 of my PR2 websites and 1 PR1 website. They are GENERAL niche blogs with different IP addresses.All my blogs are regularly strengthened with 30-200 backlinks every month.Need more SEO juice ?More Quality and Cheap gigs from PR1-5 blog posting and permanent backlinks gig !! !